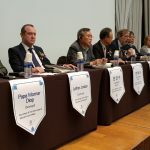 This was the title of an international conference organized by the Commemorative Association of the National Debt Redemption Movement to celebrate the first anniversary of the inclusion of the Archives of the Korean Debt Redemption Movement in UNESCO’s Memory of the World International Register. 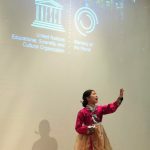 The conference was held in the Grand Hotel in Daegu on 2 October 2018, with over 200 attentive listeners. The opening speech was given by Mrs Dong-Hak Shin, President of the Association, followed by welcoming and congratulatory speeches on behalf of Mr Young-Jin Kwon, Mayor of Daegu, by Mrs Ji-Sook Bae, Chairperson of the Daegu Metropolitan Council and by Mrs Eun-Hee Kang, Superintendent at the Daegu Metropolitan office. Mr Man-Soo Han, Director-General of the Daegu Bureau of Culture, Sports and Tourism, gave the keynote speech of the conference, entitled The National Debt Redemption Movement Spirit – To the globe! To the Future! First he summarized the activities which the Association and the city of Daegu had undertaken in preparation and support of the nomination. Then he presented the step-by-step strategy for raising global awareness. Jan Bos (The Netherlands), chair of the International Register Subcommittee, presented the paper Why the Archives of the National Debt Redemption Movement have been listed on the Memory of the World International Register. He described the criteria for inscription and explained that the documents meet them well. Professor Lothar Jordan (Germany), Chair of the Subcommittee on Education and Research, spoke about Utilization Strategies for Items Listed on the MoW Register, Including Heritage Education, Promotion of Shared Values and Community Activities. He focused on three examples: A website for Intercultural Dialogue; Teaching Units for Schoolchildren; Narratives for a Wider Audience. Professor Young-Chul Kim, Dean of the Keimyung University College of Social Science, elaborated on the Global Strategy for the National Debt Redemption Movement. The plans and initiatives include digitization and translation of the archives, the establishment of a ‘Larchiveum (library, archives and museum) Hall’, and the exploration of cooperation with North Korean heritage institutions. The paper of Papa Momar Diop (Senegal), Vice-Chair of the MoW International Advisory Committee, dealt with Three Senegalese assets listed on the MoW Register, Common Documentary Heritage to nine West-African States and France, showing the similarities between the colonial archives in these countries and the Korean archives from the time of the Japanese occupation. The last speaker was Roslyn Russell (Australia), member of the Register Subcommittee. Her paper was about The Australian MoW Committee [which she chairs] and Documentary Heritage in the Pacific Region. She discussed the documents relating to Pacific colonisation and independence on the International Register and the MOWCAP Register. All papers and presentations can be found in the conference proceedings. A lively panel discussion with questions from the audience concluded the academic part of the conference. After that it was time for some nice musical performances. The grande finale consisted of several great scenes from a popular opera on the Debt Redemption Movement!